We develop statistical analysis procedures, which are supposed to be useful in psychological/behavioral sciences. But, the procedures should have such universality that they can be used in wide ranges of sciences. 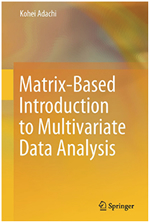 Among statistical procedures, multivariate data analysis procedures are intensively treated in our division. For our studies, linear algebra are important foundations in which mathematics of matrices are studied. Behavioral statistics can also be called psychometrics. The term is a combination of “metrics” (mathematical methodology) and “psycho” (the fields to be applied). A top journal of the area is Psychometrika. The related areas of similar naming include biometrics and econometrics. Conceive a model explaining data and form an algorithm for finding the solution … with Imagination & Speculation! Write the computer program of the algorithm to run it … so as to Feel the procedure in Reality ! Write a paper … with creating a Scenario. ! Copyright © 大阪大学 人間科学研究科 足立研究室 All Rights Reserved.